Rising food prices are changing what people eat in Australia, reveals a new global food survey by anti-poverty organisation Oxfam. Australians and people around the world are changing what they eat because of the rising cost of food, according to a new global survey released today by international aid agency Oxfam as part of its new campaign GROW. Some 62 per cent of Australians surveyed are no longer eating the same foods they did two years ago, and 39 per cent of them attributed this to rising food prices. The survey was conducted by international research consultancy GlobeScan and involved 16,000 people in 17 countries including Australia, Brazil, Germany, Ghana, Guatemala, India, Kenya, Mexico, Netherlands, Pakistan, Philippines, Russia, South Africa, Spain, Tanzania, UK and the USA. 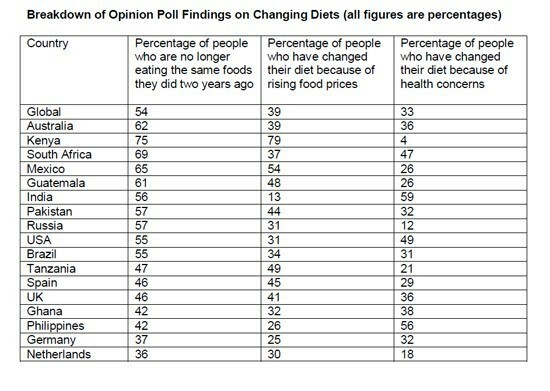 Globally, 54 per cent of overall respondents surveyed said they are not eating the same food as they did two years ago – the period before the current food price crisis began – and 39 per cent of those who said their diet had changed blamed the rising price of food. Oxfam Australia Executive Director Andrew Hewett says he hopes the findings will start a debate about how to grow and share food so everyone has enough to eat in a world where one in seven people are going hungry. The GlobeScan survey found the two most important factors concerning Australians about what they eat are the cost of food and how healthy and nutritious it is. Separate interviews conducted by Oxfam in Australia revealed interesting consumer trends including a high proportion of Australians growing some of the food they eat. Similar additional interviews conducted by Oxfam overseas provide further anecdotal evidence that many people in developing countries are either eating less food, eating cheaper items or enjoying less diversity in their diets as a result of rising food prices. Oxfam is Australia's leading agency working with communities around the world for solutions to poverty and social injustice. How to help the poor get better access to food: Eliminate the huge amount of agricultural subsidies in Europe and the USA and give better access to producers from poor countries. Of course that will never happen, because the farm lobby is very strong, so I predict we will still be “debating” this 10 years from now.